There are many ways to make friends and chess is one of the best ways to meet them. Last year, the first "Friendship Match" was held featuring two young players of which Ronnie 'RJ' Nelson was one of them. Last year, Nelson split two games with Jayel Taylor in the inaugural match and this year he would face a very talented Joshua Colas of White Plains, New York. Both players were excited about the prospects of playing this match and when Colas was told about the previous matches, he said, "When am I going to play the guy from Trinidad?" So after a bit of negotiation, the match was on. On July 22nd at 6:00pm, both players were ready and pawned off at the Internet Chess Club. 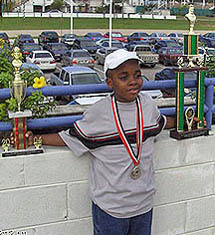 Joshua won both of the games which were interesting but were plagued by oversights. The Chess Drum's 3rd "Friendship Match"
Game #1… At seven years of age, Joshua Colas has already started playing the Najdorf Sicilian. During the match, his uncle Clotaire Colas mentioned that Joshua's father (Guy Colas) had been working on the opening with him. In this game Joshua played 1…c6 against RJ's 1.e4. It is not certain whether that was a mouse-slip or he actually intended to play the Caro-Kann. Up a piece for a pawn, RJ started to lose focus and moved his bishop around the queenside aimlessly. Soon he put the bishop in harm's way and forgot about its safety. 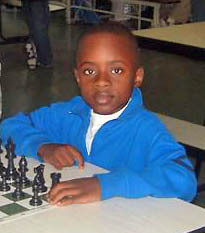 Joshua played a tricky double attack on the queen and the roaming bishop. RJ left the bishop hanging and after that, Joshua bore in, won another pawn and ended the game with checkmate. Game #2… RJ now had black and would seek to avenge his earlier loss. 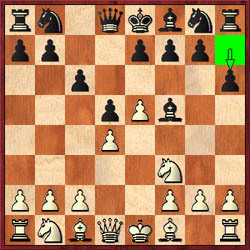 This game was interesting in that the positions arising from the opening (Queen's Gambit Declined) were very rich with possibilities. 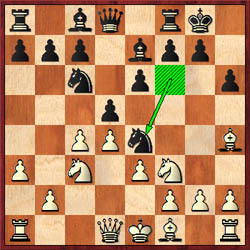 RJ played the tricky 8…Ne4. However, this move provided white with a slight edge in the center. As it turned out, the game had a tactical flourish and many pieces were traded down into what seemed like an inevitable draw. Joshua forged ahead with 17.Ne5 attacking a backward c-pawn and also a loose bishop on g4. 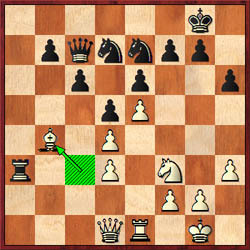 Concerned with losing the exchange, RJ played 17…Rd6 and Joshua immediately snapped off the piece with 18.Nxg4. 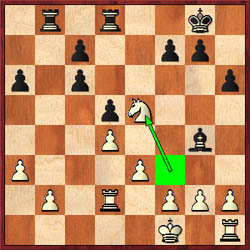 RJ played on and eventually ditched all of his pawns trying to create stalemating tricks with a "super rook." It was not to be and Joshua finished the game with checkmate. This match was a good exercise for both players and it allowed them to see how they would fare against someone of equal standard. In the final analysis, Joshua appeared to have a better command of the board and apart from his oversight in game #1, he played with more consistency. RJ played the openings well, but seemed to lose track of his pieces as indicated by gross oversights in both games. Both players were appreciative of the chance they hope to meet each other in the future. Note: Thanks to all supporters who observed the games and who sent their well-wishes.